I usually don't like these combo golf clubs sets. However, most golf club combo sets are cheap crap that you will outgrow in a few months. This is not the case with this set of TaylorMade Burner Irons. 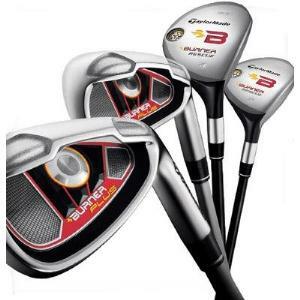 These are good quality golf clubs that I would highly recommend for those of you just starting out. First of all, these clubs have a huge sweet spot. The large perimeter clubface will help give you some forgiveness on off-center hits. The sole of these clubs is wide and beveled. This brings the center of gravity low and deep which will help you get the ball up in the air quickly. The best thing about these clubs, and why they are a little more expensive than your typical "Walmart Starter Kits," is the shafts. These are TaylorMade's well known Burner shafts. These shafts are very light and long. This promotes a higher swing speed, which obviously gives you more distance. If you are starting out and feel like you might spend some time on this great game of golf, I would recommend spending the money for this TaylorMade Combo set. This is a high quality golf club, designed for the beginner, but good enough so that you won't have to go out and buy a new set as soon as you improve.